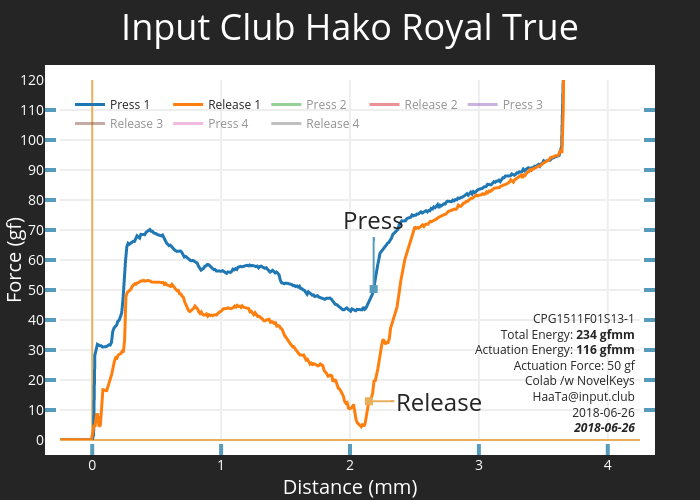 Royal True switches (pink slider, black lower housing), which iterate on Input Club’s Hako switches, use a thicker contact leaf to dramatically increase tactility. Elements from Cherry MX Clear and Topre are combined with a heavy spring to create a cushioned, bottom-out resistant experience. Precision molds and tooling from Kaihua made the switches last 25% longer than regular MX variants during stress testing. In addition, the bespoke slider design virtually eliminates wobble. Community enthusiasts Jacob Alexander (HaaTa) and Brandon Muzzin (Over^Kill) designed custom springs for the Hako line. Royal Trues use a heavy spring and have a peak tactile point of (approximately) 63 grams. Tactility occurs early in the key press. A 30 gram post-tactile cushion, in the form of a resistance ramp, essentially prevents bottom-out. Box switches use a square slider design and sealed contacts that provide superior contaminant protection. If liquids or dust somehow penetrate a switch, lower housing vents and a slider drainage port eject the unwanted substances.